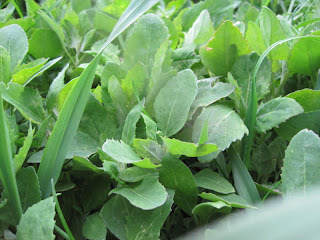 This patch of lamb's quarters looked so tempting I picked some to offer to the sow that farrowed on Monday. She's been spending all her time in the hut with her new litter and I thought she might like a bit of something green to eat. She seemed to be able to smell it as soon as I stepped in the doorway and eagerly ate it right out of my hand. She enjoyed it so much I went back for another handful and even added a couple fresh eggs to the meal. I really meant to give her just the one egg, but she seemed to like it so much that I couldn't resist giving her another. When I was a kid I used to spend the whole day in our barn with a new litter of kittens if the mama cat would let me. Barn cats can be rather particular about keeping their kittens hidden so sometimes I had to be satisfied sneaking a peak when I knew the mama was out hunting. Ducking into the farrowing hut brings me back to those days as a kid and makes me wish I had nothing else to do but sit with the pigs.